Artist/Author: Govaerts, Rafael and John Dransfield. The palm family, considered to be second only to the grasses among monocotyledonous plants of economic importance, is of immense significance to man, especially among rural communities in the tropics, where wild palms are intensively utilised. 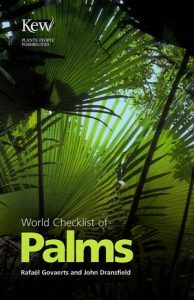 The world checklist of palms is the unique resource that lists all validly published names of palms, providing the source of their publication and indication of which names are currently accepted and which are synonyms. It will provide a standard nomenclatural reference for further research into this important family. It also contains lists of all palm names ever published, and all accepted species with their geographical distribution, indicates full synonymy, provides a single source guide to the correct names of all palms.